I got both 52 Reasons and Monument 14 signed at the Fierce Reads event in Omaha I will have a full recap of the event posted on Tuesday! Make sure to support The Darkling and enter to win a copy of Shadow and Bone OR Siege and Storm! Ohhh! I've got to read Addicted to You and 52 Reasons to Hate my Father! They both look fantastic. Woooow an amazing haul! There are so many of those books that I cannot wait to get my hands on :D.
Crown of midnight!! I can't wait to read this one. Enjoy :)! Got some happy reading ahead of you. Tied is a new one. Have to check it out. So excited for Crown of Midnight!!! You had an awesome haul! I still haven't read Throne Of Glass, I need to get on that! Happy Sunday! Amazing haul! 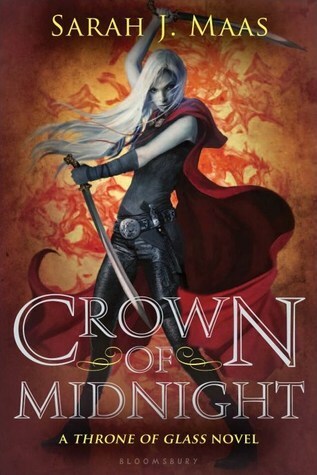 I can't wait to read Crown of Midnight. Come see what I got at Inside of a Dog and Ms. Martin Teaches Media. Happy reading! Great haul! I still need to read Throne of Glass. I've heard great things and have it ordered at the library. Slated looks great, too. Happy reading! 52 Reasons to Hate My Father is really good! And YAY for Crown of Midnight! I love Of Silver and Beasts SO MUCH! Team Human was pretty good. I hope you enjoy all of your books! Sooo I LOVED tale of two cities. I'm actually not a big fan of Dickens but I really really loved that one! I named my fish Darnay after I read it back in the day, haha. And great haul! Glad you were able to go to the Fierce Reads event! I have an ebook of Monument 14 and need to read it. I've heard good things about that and Team Human. So happy for you that you got Crown of Midnight - I can't wait to read that one!!! Thanks for visiting my STS/IMM! I really liked Monument 14 last year; I think the sequel is out pretty soon. I'll be sure to vote for the Darkling. :D Just finished Siege and Storm, it was awesome. Thanks for stopping by my StS! So many wonderful books! I really want to read Crown of Midnight & Tied. Nice haul! Tied looks really good. I have a Shade of Vampire, but still need to read it. Enjoy your new books! Oh, signed books! Those are the best. I just picked up Team Human from the library. I hear such great things about it! Hope you enjoy! Nice haul! I haven't heard of Tied, I'll have to look it up. Enjoy and thanks for stopping by my blog. i'm so jealous you got to attend a fierce reads event. i've never been to any author tour events because they don't come to hawaii.